During the coming weeks we are featuring work by artists who have defied all fashion and decency by attaining the age of 75+ – but continue to do new stuff. The first of our celebrated seniors is Alex Wheeler, who used to be a sculptor but now finds chiselling stone a bit hard to manage and is retraining as a painter. She is currently a pupil of one of our leading artists, Melissa Scott-Miller, at Heatherley’s fine art school in Chelsea. 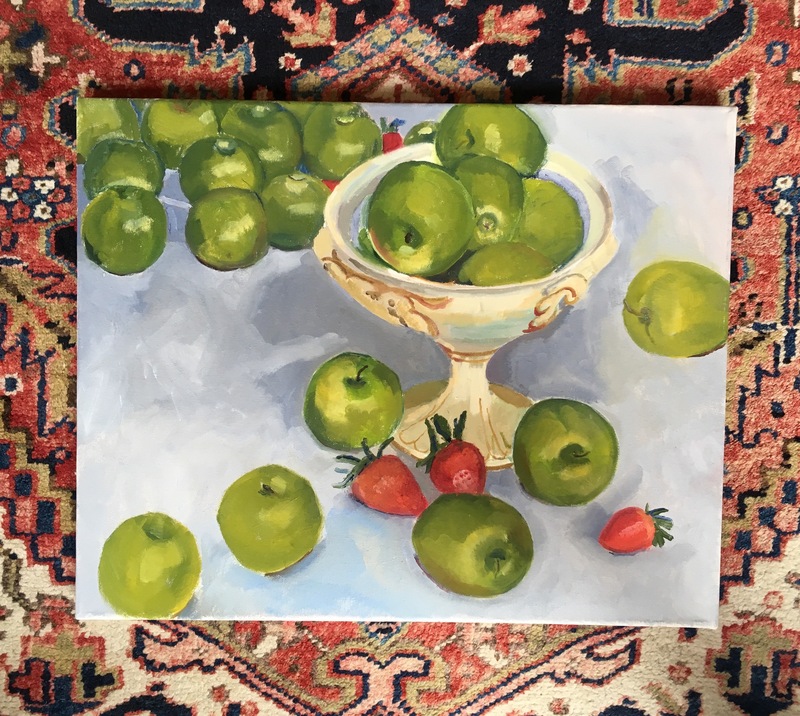 NB The snapshot of her work Green Apples was taken on the floor of her living room: hence the Indian carpet pattern surrounding the painting. More of her works are for sale in our Affordable Art section. Nicholas Barnham was born in 1939. Our gallery has several of this watercolours, painted in the early 1970s, though today his speciality is linocuts like this one, titled Breadwinner, which he prints with the help of a mighty cast iron Victorian press in his studio in Wells-next-the-Sea in North Norfolk.